As I rode the subway from my parents’ apartment in the Mecidiyekoy neighborhood of Istanbul to meet a friend for coffee in Taksim this summer, I was keenly aware of my decision to wear a skirt that hit above my knees. In my quest to be comfortable in the scorching heat, I ended up feeling more uncomfortable than I would have felt if I had layered on a wool pullover instead, so intense was the harassment I received from men. And while I get to escape this discomfort every time I head back to the States, for many of my female friends and relatives who live in male-dominated spaces in Turkey, their only options are to cope or to react. A Turkish woman’s decision to wear her hair uncovered or even laugh in public can be a controversial one. As a result of the political climate, Turkish women are, little by little, losing their right to exist in public spaces. 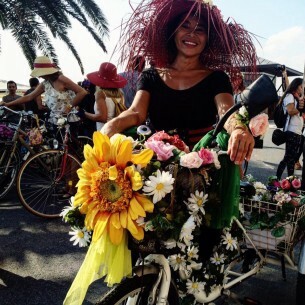 “Fancy women on bikes” or, “Suslu kadinlar bisiklet turu” is a profound, multi-pronged response to the exclusion many Turkish women feel in cities like Istanbul and Izmir. By dressing up in costumes and bright makeup, these women are reclaiming their right to be seen, to be noticed, and to exist. 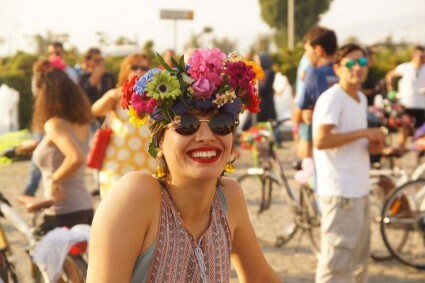 They’re challenging the prevailing norm in Turkish society (and in many Middle Eastern cultures) that encourages women to keep their heads down and blend in as much as possible. They’re standing up against the view in Turkish society that women shouldn’t occupy public spaces in the same capacity as men, that women should be transient and unremarkable. And it’s about time such harmful norms are challenged — Turkish women have been through a lot, these past few years. President Erdogan has called women who choose careers over motherhood “half persons” for failing to meet their primary obligations to society. He’s also claimed that women aren’t equal to men because that would go against the laws of nature. And of course, few can forget the social media backlash of #direnkahkaha when one of Erdogan’s deputies lectured Turkish women about how uncouth it was for them to laugh in public. The country has fallen a long, long way from the days of founding president Mustafa Kemal Ataturk, who championed equality for women in a secular Turkey. With the country divided between conservatives who are eager to tarnish Ataturk’s vision of Turkey, and those fighting against them, minority groups are shining a light on injustice. 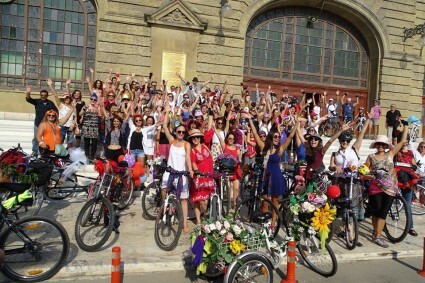 Enter: “Fancy Women on Bikes.” They staged their first first tour in Izmir back in September of 2013, with the aim of “replacing exhaust fumes with the smell of perfume.” The inaugural tour happened just a few months after a summer defined by the Occupy Gezi movements, which pitted thousands of Turkish civilians against the conservative AKP’s totalitarian regime. Women played a critical role in Gezi, staging sit-ins, taking their places on the front lines against police brutality, and disseminating information the media was withholding about the government’s aim to convert a beloved public park into a shopping mall. Fatma R., a 25-year-old Turkish college student remarked: “In essence, the violation of Gezi Park was not dissimilar from the violation women in Turkey have been experiencing in the past few years — a public space was rapidly turning into one that would be less welcoming to many citizens.” The main difference? The loss of Gezi Park was much easier to identify and rebel against than the unspoken, painful cultural norms that shifted to limit Turkish women’s expression. The use of bicycles as the centerpiece of the movement isn’t a coincidence, either. The ability to cheaply transport oneself is incredibly empowering, and to do it visibly as a woman? Revolutionary! Sema Gur, who originated the movement, cites the intimidation and catcalling women face just walking down the street as a key reason for why women have long felt too uncomfortable to bike. It’s precisely what sparked the inspiration to organize around this issue. One of the most satisfying results of her work? A “Bicycle Desk” has been established with the Izmir municipality, which registers complaints from bikers across the city. 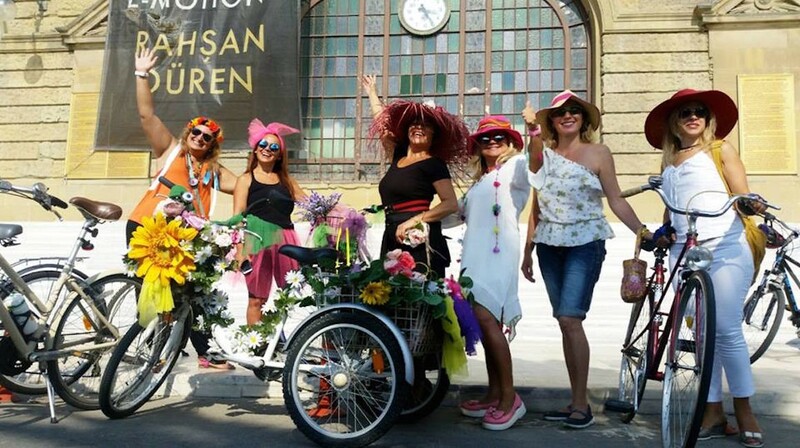 At the end of this year’s September 24th tour in Izmir, the participants of the latest “Fancy Women on Bikes” tour parked their bicycles in the shape of a massive heart and danced to the tune of a Turkish pop hit “Hayat Bayram Olsa” (“If Only Life Were a Feast”). But the truth is, these women don’t even need a feast: They’re looking to reclaim a seat at a table that they’re increasingly being pushed away from.